Below are my New Year's Resolutions from December of 1975. 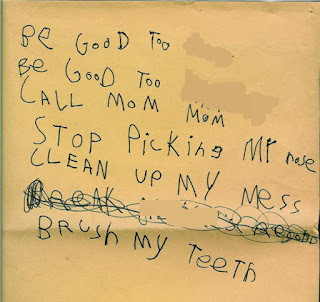 I suspect I was also trying to cure myself of calling my mother, 'Mommy,' as I can't think of anything else I would have called her at that age. My kind and loving wife tells me there is still one of these I need work on. I will let everyone guess. 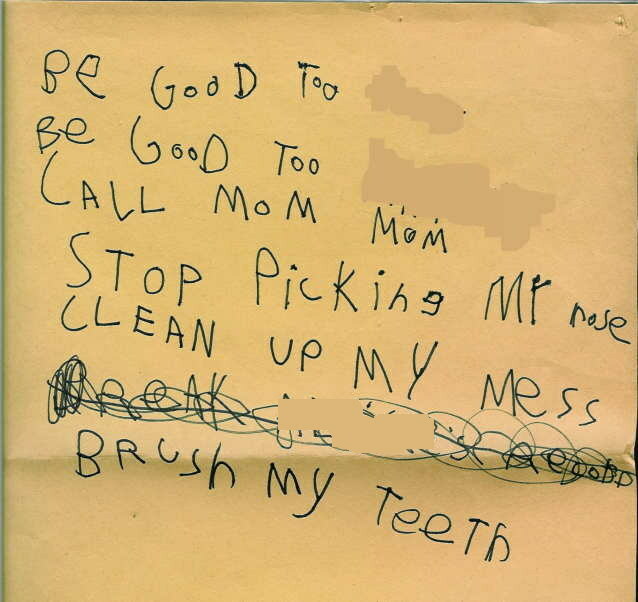 She tells me also that my handwriting was better back then. Note: I am posting this several days early. Our Weekly Picks will be taking a holiday, and will return Sunday, January 6th. Evidentia, a new genealogical software program was released this week. This one isn't like the others, as its focus is on evidence, not people. For the past several weeks there has been a group of beta-testers, and some of them are providing reviews. Similarly, since the application is now released to the public, some non-beta-testers are providing reviews, as well. Jenny Lanctot at Are My Roots Showing? I did participate in the beta-testing period, but unfortunately, haven't had a great amount of time to test it out, and I don't have the time to write up a full review. However, I liked what I have seen. I feel it would be a great secondary software program for me to focus on gathering and visualizing the evidence for selected brick walls. It would also be useful for creating a database for my family records, and transcriptions. Currently it doesn't allow for attaching files or transcriptions, but I have been told by the creator that that is planned for a future update. It will not work as a primary genealogy database for me, and I don't believe it is the intent of the creator that it should. Some (perhaps many) will find its inability to import or export into the standard GEDCOM format a deal-breaker. However, GEDCOM doesn't include a standardized method for handling citations. Evidentia is built around evidence and citations. Oil and Water don't mix. Since those with large databases will not want to manually copy information to a new database, those who use Evidentia will likely use it for select individuals. There are both PC and Mac verstions, however, if you are a Mac user you need to have the 10.7 OS (Lion) or above. There are screenshots, tutorials, and sample reports on the software site. RootsMagic released an iOS app for the iPhone, iPad, and iPod Touch. Randy Seaver at GeneaMusings has taken a first look at the app, as well as a second. Tamura Jones at Modern Software Experience also has given it a review. I'm unable to test it out, as while I have both an iPhone, and an iPod, it's a secondary app that is meant to accompany their full software package. It can't stand alone, and their full software is PC only. Instagram released new Terms of Service this week that seemed to permit the company to sell user photos to advertisers without paying the user anything. [Source: Good Morning Silicon Valley] Instagram has responded, and said the terms were misunderstood. They have assured their users they will clarify their terms. However, as GMSV pointed out, in an era of 'free software' you get what you pay for. It is always better to be the purchaser of a commodity, than the commodity that is being purchased. Judy G. Russell at The Legal Genealogist provides a good summary of the events. Good Morning Silicon Valley also predicts the next Social Networking outrage: Auto-Playing video advertisments on Facebook. Rumored to be coming by April 2013 on both desktop and mobile versions of Facebook. Michael Hait, at Planting the Seeds, defines for the genealogist, The most important thing you can ever prove. I agree with him on the importance, and difficulty at times, proving this. Philip Moeller at US News and World Report discusses how Digital Stories Preserve and Share Memories. His article includes a review of the StoryPress website and apps. Stuart Rockoff at MyJewishLearning shares some historical resources for small communities in the Southern US. In Why We Don't Write, and How We Can, Harold Henderson at Archives challenges us to become better buffalo hunters. In The Bloggers' Best Selections Diane Boumenot at One Rhode Island Family solicited submissions of 'favorite' posts from other genealogy bloggers. Tamura Jones at The Modern Software Experience takes a look at the Genealogy Communities that have been created on the Google+ network in the past week since Google introduced the Community feature. In Why can't the media get the facts straight in Connecticut, Charles Apple, at The Visual Side of Journalism discusses the issues with 'breaking news reporting' and how reporters handle constantly changing facts. I thought I noticed some parallels in his description of news research to that of genealogy research. We too can make a mistake when we try to reach a conclusion before our research is complete. Michael J Leclerc at Mocavo Blog asks if it is Curtains for Cursive, as many schools across the county are ceasing instruction in script. Michele Simmons Lewis at Ancestoring discusses graphology, or the analysis of handwriting to uncover personality traits. Barry Wheeler at Digital Preservation looks at the process of scanning documents, and addresses the question: What Resolution Should I Use? Jen Hodnett at the Ancestry Blog explains how to merge duplicate records in their online family trees. Daniel Hubbard at Personal Past Mediations describes what he calls, Pyrrhic Research, and why it is important to avoid it, whether you are researching Homer's Iliad, or your family's oral history. As did Pat Richley-Erickson at Dear Myrtle also took A First Look. Judy G. Russell at The Legal Genealogist compared the legal terms of service for the various newspaper archival sites. Michael John Neill at RootDig illustrates the occasional importance of color records. Julie Cahill Tarr at GenBlog takes a risk by suggesting Some People Just Aren't Cut Out for Genealogy Research. Leslie Johnston at Digital Preservation shares a story of When Data Loss is Personal. James Tanner at Genealogy's Star explains that sometimes Focusing on a Problem, is the Problem. Daniel Hubbard at Personal Past Meditations in Up Close and Personal outlines why he prefers to think about the proximity of a record instead of the traditional terms of primary, secondary, original and derivative. Jill Hurst-Wahl at Digitization 101 considers The Importance of Physical Space, and how the layout of a library is important. Denise Grollmas at TabletMag writes about a Jewish Revival in Poland, where the grandchildren of those who hid their religion, are rediscovering, and embracing, their roots.